And so it begins. The first breath of spring in this land of the white pines. A soft inhalation of welcome, laced with promise. Anticipation. The woods pond is suddenly bigger by half, its waterline bulging into the interseasonal zone’s soggy-footed grasses and—presto—alive again with ducks: ten mallards, already sorted into five tightly-bound pairs. Relaxed, attentive, they move together, keeping a comfortable distance from the human making his way along the trail a few yards into the woods, whose feet fall softly and slowly among mounds of mosses—bright, engorged, alert—that sprawl over roots and rotten stumps in the boggy woods. And so it spins, today’s in-breath but one of many that will carry us out of the skin-chilling months of winter’s penetrating embrace. This day, this week, this very moment, each rises and falls away one after another—the stillness and bluster of winter also a deep breath enlivening the great pulse of our planet; all these breaths giving rise to the heartbeat of life here in our thin earthly skin where soil and sky touch, reach into each other, interpenetrate. . . . dancing alive this singular, symbiotic wholeness and each of its integral, particular faces. And so it is. Water pooling atop saturated soil, bogs softened, filling and spilling across woods duff into yards-wide mini lakes. 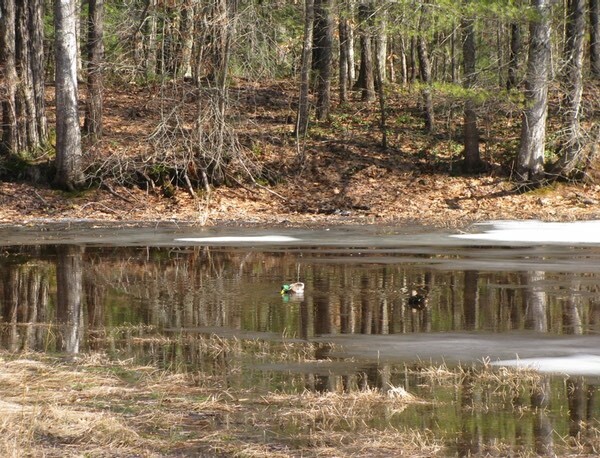 The pond spreads to fill its little clearing, even as ice lingers; one of the ducks steps up onto this milky-white remnant to stand and stretch with a patti-pat-pat of wing slaps. The others graze, bottoms-up in turn, on greenery sprouting from the mud a few inches below the surface, a variegated mirror laced with dark and bright reflections of tree trunks on the far shore, their bare twigs now hissing in a passing breeze; beyond, a hundred-foot pine tosses to and fro with a roar of its own. The warm wind plays in the woods all around, enlivening the space with a finely-honed sense of rhythm and depth: airy fingers brushing through a cluster of pines at the end of the pond, setting them astir. . . and now caressing a bushy high crown directly overhead into a throaty sigh. The pulses of this aural tapestry rise up and fall away on all sides, one or two surging to a crescendo every ten seconds or so, overlapping, giving way to the next—over here, now there, and again moving on—layering into an immersive surround-sound whole that encompasses and cradles the pond’s swelling shoreline with its ice and its ducks and its hidden hoards of slumbering amphibian serenaders of dusks to come. Now a puff of breeze skims across the pond’s surface, countless tiny ripples dancing and sliding, a patch of shimmering light blinking across the water, then gone again, the gust skipping back up as it approaches, lifted again toward the clouds by the trees on the near shore. The ducks meander together around the pond, muttering among themselves. A songbird trills nearby, staking his claim. A chest swells, contracts, swells again, taking the moment to heart. Tall pines sway, the sun glows a bit brighter through thinning clouds, the stream feeding the pond gushes wide and strong past leaf-packed banks. This week may feel like a turning, yet even tonight will drop to near zero, the ice spreading once more—thin, transient—sending these eager ducks back to one of the briny estuaries four miles south or the flowing river a half-mile east. Just so: a breath in the body of our land of the white pines. A beat of the earthly heart. The ephemeral, palpable embrace of a woods pond at midday in the season of vernal stirrings. Posted on 2016/03/08, in Earth, Jimwords and tagged maine, nearby nature, spring, wiggins. Bookmark the permalink. Leave a comment.